Laugh, gasp and shake your head as your Ultimate London 2-Day Special Private Tour takes you through the sights, sounds and stories of one of the greatest cities in the world. 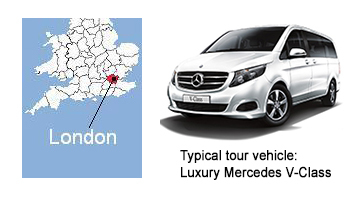 On both days your driver-guide will pick-you up from your central London hotel or place of residence at the specified time. Lunch can be arranged at an appropriate venue (tour price does not include food or refreshments). The tour is offered at a special reduced price, saving you at least £175.00 against booking the two options separately. Tour days must run consecutively, so choose the dates to suit your schedule. All attraction admission fees will be booked in advance. Your guide will take you via a private entrance whenever possible, avoiding delays in lines. First, Blood, Bling & Beefeaters! It’s ‘off with your head’ as we take a private guided tour of the Tower of London, London’s oldest building and a World Heritage site. Officially known as Her Majesty’s Palace and Fortress but once described by Shakespeare as ‘The Slaughterhouse’. The original ‘Tower’ was built for William the Conqueror almost 1,000 years ago, and as you will see, successive monarchs added their own defences over the years (to demonstrate their popularity!). The guided tour touches on the tragic tale of Anne Boleyn, second wife of Henry VIII. You will discover his cruelty knew no bounds. See the awesome Crown Jewels, king of bling! Seek out the mysterious ravens. Smile with a superb photo opportunity in front of Tower Bridge. And hear how the famous Beefeaters, also known as the Yeoman Warders, with costumes designed in Henry’s reign, look after a London landmark simply drenched in history. Finally, we visit Churchill’s War Bunker. Winston Churchill was the British Prime Minister during World War Two, and here, in his underground HQ, that terrible conflict is brought to life. This series of underground war rooms was completed just before the outbreak of war, accommodating map rooms, cipher rooms, switchboards and emergency living quarters used for the entire 1,562 nights of the war. From here, many of Churchill’s great speeches were broadcast. Almost all his directives and instructions were dictated in these rooms. Room 63 was a broom cupboard disguised as lavatory where Churchill had his hotline to President Roosevelt. It was set up using a revolutionary encryption device to mask conversation with ‘white noise’. A fascinating time capsule, the bunker closed down in 1945 and was not re-discovered until 1973. Includes superb Churchill museum, featuring interactive exhibits, mementos from his life and the original door from No.10 Downing Street. Our day starts with a visit to St Paul’s Cathedral for a private guided tour of the Defiant Giant: Symbol of national pride, focus of London spirituality, and a glorious architectural masterpiece: 50 years to build, 300 years of history. Many important historical events have happened here: the funerals of national heroes Wellington, Nelson and Churchill. This was also the venue where Prince Charles and Lady Diana took their vows in their spectacular, but ill-feted wedding in 1981. The view of the famous sweeping steps may jog some memories, particularly that seminal moment when Diana stepped out of a golden fairy-tale carriage wearing ‘that’ dress. A major movie location, the church has been used in recent films such as Harry Potter, Sherlock Holmes and National Treasure. The impressive interior boasts fantastic decor, wonderful monuments, and an inside view of Sir Christopher Wren’s magnificent dome, which, if you are feeling energetic, may be climbed for a superb bird’s eye view of London. Next, to Shakespeare’s Globe. We join an in-house tour to see this faithful re-creation of the famous 16th century theatre by the riverside, and scene of the Bard’s greatest triumphs. The original Globe Theatre was built in 1598 on the south bank of the River Thames – a crucible of cultural flowering – and demolished in 1644. The New Globe was completed in 1997 by the American film producer, Sam Wanamaker (father of Harry Potter actress Zoe Wanamaker), and transformed the local area of Bankside. Queen Elizabeth II came here during the first season. With a capacity of 1,600 (900 seats), the reconstruction time lasted 14 years longer than the original, using the original plans and original materials: a wooden frame, a thatched roof, and not a single metal rivet! Described as a fusion of 3 ‘A’s: actors, audience and architecture, it’s a working open-air theatre, exhibition and tour with shops and restaurants. In 2013, a separate Jacobean-style theatre was built inside the complex. In the afternoon, we visit the British Museum for a private guided tour of civilization’s hall of fame! The iconic British Museum was founded over 250 years ago in the academic heartland of London known as Bloomsbury. Recently remodelled, this independent institution prides itself on being the world’s first free public museum. Step into the Great Court and marvel at the magnificent glass roof. Below are the seven million objects that make up the greatest collection of antiquities in the world. This tour examines the Museum’s top 10 treasures from major world cultures. From Ancient Egypt, the Mummies, Statue of Ramesses and the famous Rosetta Stone. From Ancient Assyria, the sculptures of King Sargon’s Palace. From Ancient Greece, the Elgin Marbles. From the Pacific, the Easter Island Statues. From Britain, the Roman Vindolanda Tablets, the early Christian Hinton St Mary Mosaic, the Saxon Sutton Hoo Treasure, and the Viking Lewis Chessmen. Finally, we ‘get around London’ with a flight on the city’s most popular paid-for visitor attraction, the London Eye. Indeed, it was recently voted the world’s most popular tourist attraction, attracting 3.75m visitors per year, more than the Pyramids of Egypt! But don’t worry about the queues, as line-busting fast-track tickets are always available. The world’s biggest and most famous observation wheel was erected to celebrate the Millennium. With engineering by the vehicle manufacturer, Skoda, it is 350ft high, turns at 1mph, and takes 30 minutes for a full rotation. There are 32 pods in total, the same number as there are London boroughs. With 26 people able to fit in a pod, the Eye can accommodate almost 1,700 people per hour. It offers unrivalled views of London. On board you can take in the vastness of the city. Kids can play the world’s biggest game of ‘I Spy’, and as a group you can be photographed as you ‘come in to land’. ● The two tour days must run consecutively. Days may be switched to suit. ● Westminster Abbey and St Paul’s Cathedral are closed on Sundays. ● A visit to the Royal Stables can be arranged if the Changing of the Guard is cancelled or not scheduled. 1-2 = £945.00*; 3-4 = £1,015.00*; 5-7 = £1,085.00*. *Not including entry tickets to attractions booked in advance. These are skip-the-line tickets charged at standard rate including all booking costs.